Ross (groin) has been ruled out for Sunday's game against the Buccaneers, Katherine Terrell of ESPN.com reports. Analysis: With the Bengals on bye Week 9, the soonest Ross will play in a game is Nov. 11 against the Saints. In his absence this weekend, Alex Erickson and Cody Core are candidates to see added snaps behind Cincinnati's top wideouts, A.J. Green and Tyler Boyd. Ross (groin) wasn't spotted at practice Thursday, Paul Dehner Jr. of The Cincinnati Enquirer reports. Analysis: Ross's absence for the second straight day of practice this week adds further fuel to the notion that the groin injury will prevent him from playing Sunday against the Buccaneers. If Ross is sidelined, Alex Erickson and Cody Core would likely draw more snaps in three-receiver sets, though neither projects as an especially appealing fantasy option with A.J. Green and Tyler Boyd locked in as Andy Dalton's preferred targets. Ross (groin) didn't practice Wednesday, Geoff Hobson of the Bengals' official site reports. Analysis: Per Katherine Terrell of ESPN.com, it's unlikely that Ross will play Sunday against the Buccaneers, but he has yet to be ruled out for the contest. The speedy wideout is dealing with an aggravation of the groin injury that forced him to miss time earlier this season. If Ross is indeed sidelined this weekend, Alex Erickson and Cody Core would be the top candidates to see added snaps behind Cincinnati's top wideouts, A.J. Green and Tyler Boyd. Ross is expected to miss a few weeks due to the groin injury he suffered in Sunday's 45-10 loss to the Chiefs, Mike Garafolo of NFL Network reports. Ross left Sunday's game against the Chiefs with a groin injury and will not return to the contest, Paul Dehner Jr. of The Cincinnati Enquirer reports. Analysis: Ross missed a Week 6 loss to the Steelers with a groin injury, but he then logged full practice participation throughout the week and was cleared on the final injury report for Sunday's game against the Chiefs. He'll finish the night without any catches on just one target, with his absence leaving more snaps for Alex Erickson. 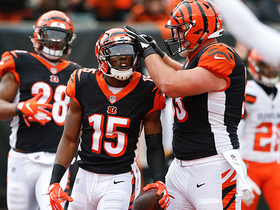 Ross (groin) practiced fully Wednesday, Geoff Hobson of the Bengals' official site reports. Ross (groin) is inactive for Sunday's game against the Steelers. Analysis: With Ross out, A.J. Green and Tyler Boyd will continue to head the Bengals' Week 6 wideout corps, while Alex Erickson figures to work as the team's No. 3 option Sunday after catching all three of his Week 5 targets for 24 yards. Ross (groin), who is listed as questionable for Sunday's game against the Steelers, isn't expected to play, Ian Rapoport of NFL Network reports. Ross (groin) is listed as questionable for Sunday's 1:00 ET game against the Steelers after practicing in a limited fashion all week, Geoff Hobson of the Bengals' official site reports. Analysis: The speedy 2017 first-rounder certainly has field-stretching ability and play-making upside, but for the time being fellow wideouts A.J. Green and Tyler Boyd are ahead of him in terms of volume. 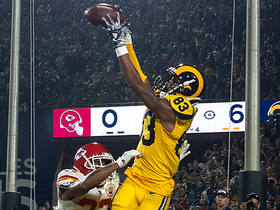 That reality makes Ross -- who has seven catches on 15 targets for 79 yards and two TDs in four games to date -- a hit-or-miss fantasy option, when available. Ross (groin) was a limited participant at Thursday's practice, Paul Dehner Jr. of The Cincinnati Enquirer reports. Analysis: Ross was also limited at Wednesday's session, so he may need to put in a full practice Friday to avoid an injury designation heading into Sunday's matchup with the Steelers. While Ross was sidelined for the Week 5 win over the Dolphins with the groin strain, Alex Erickson stepped in as the Bengals' No. 3 wideout, but didn't make much of an impact in the box score (three catches for 24 yards on three targets). Ross (groin) was a limited practice participant Wednesday, Katherine Terrell of ESPN.com reports. Analysis: Ross was also a limited participant last Wednesday, but he then regressed to non-participation the following two days. It thus stands that any form of participation Thursday would mark a step in the right direction, potentially allowing for a return to game action Sunday against Pittsburgh. His speed is useful to the Cincinnati offense, but Ross doesn't seem to have much upside in terms of regular target volume so long as A.J. Green and Tyler Boyd are both healthy. Ross (groin) has been ruled out for Sunday's game against the Dolphins, Paul Dehner Jr. of The Cincinnati Enquirer reports. Analysis: The Bengals will miss Ross's speed and play-making potential in Week 5, but fortunately their top two wideouts, A.J. Green and Tyler Boyd, will both be available. Ross (groin) didn't practice Thursday and was instead restricted to doing elliptical work on the side, Katherine Terrell of ESPN.com reports. Analysis: After coming out of the Week 4 over the Falcons with the groin injury, Ross was a limited participant in Wednesday's practice. The fact that he's working out with the rehab group a day later suggests he may be trending in the wrong direction as the Bengals' Week 5 matchup with the Dolphins approaches. Ross could restore some optimism about his outlook for the weekend by returning to practice Friday in some fashion, but for the time being, his status for Sunday looks to be up in the air. Ross was limited at practice Wednesday due to a groin issue, Geoff Hobson of the Bengals' official site reports. Analysis: The speedy wideout's status will thus need to be tracked as Sunday's game against the Dolphins apparoches. Through four games, Ross has caught just seven passes on 15 for 79 yards, but two of those receptions went for touchdowns. The 2017 first-round pick certainly has play-making upside, but for now, he trails fellow wideouts A.J. Green and Tyler Boyd in terms of volume by a sizable margin. 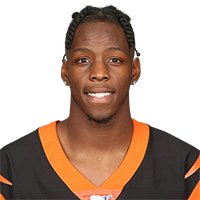 Coach Marvin Lewis said Ross pulled a muscle during Sunday's 37-36 win over the Falcons, Geoff Hobson of the Bengals' official site reports. Analysis: Ross came up limping at the end of his 39-yard touchdown in the second quarter, but he continued playing until late in the game. He finished with two catches for 52 yards and the score on two targets, falling shy of five targets for a third time in four weeks this season. The Bengals will turn to Josh Malone or Alex Erickson for the No. 3 receiver job if Ross isn't available Week 5 against Miami. Ross turned seven targets into just three catches for 16 yards in Sunday's 31-21 loss to Carolina. Analysis: Ross was quiet in this one, even after A.J. Green left the game with a groin injury in the third quarter. Fellow Bengals wideout Tyler Boyd has 223 yards and two touchdowns over the past two weeks, so Boyd would certainly be the first player owners should try to spring for should Green sit out next week's road clash with the Falcons. Ross was held to one catch for eight yards on four targets, along with one carry for minus-three yards in Thursday's win over the Ravens. Analysis: Meanwhile, Tyler Boyd had a big day in the slot. It's only two games, but so far Ross is profiling as a boom-or-bust type of player, with limited opportunities to boom. Ross caught his first NFL touchdown pass in Sunday's win over the Colts, a three-yard reception in the second quarter. Analysis: Though Ross was on the field for 36 snaps, he was targeted just twice on the day with that one catch. He draws the Ravens on Thursday night in Week 2. Ross caught two of four targets for 66 yards and a touchdown in Sunday's 26-13 preseason win over Buffalo. Ross caught one of three targets for 29 yards and scored a two-point conversion during Saturday's 21-13 preseason win over the Cowboys. 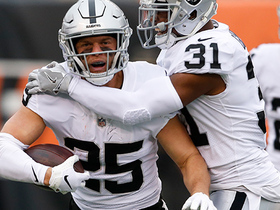 Analysis: Ross waited until the second half to make his presence felt, registering a 29-yard gain to set up a field goal before capping a long touchdown drive with a catch for a two-point conversion. The second-year pro has just two catches to his name this preseason, but he's totaled 49 yards on those grabs, illustrating the explosive nature of his skill set. Ross is looking to stake his claim to a role in the offense and will look to get more involved next week against the Bills. Ross caught one of five targets for 20 yards during Thursday's 30-27 win over the Bears. Analysis: Ross' 20-yard catch-and-run set up Cincinnati's second score of the game. He was a huge disappointment as a top-10 pick last season, but he's reportedly bulked up and climbed up the depth chart this offseason. 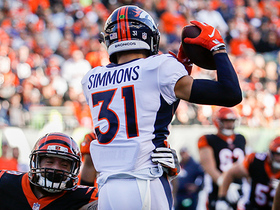 If he's able to rebound this season, he could change the complexion of the Bengals offense, forcing teams to either provide help against his otherworldly speed or face the potential consequences. The Bengals released Brandon LaFell in large part because Ross and Tyler Boyd have looked so good in camp and were expected to take on bigger roles, the Dayton Daily News reports. Analysis: While this release seems shocking to us and to LaFell's teammates, LaFell and his agent saw the writing on the wall and were actually requesting his release. This news however doesn't guarantee that Ross will start - it could very well be Boyd lining up opposite A.J. Green. But Ross will see the field more regardless, plus the Bengals would prefer if Boyd ends up being the slot receiver. In fact, the Bengals need him to see more action if there is any chance of them having a successful season. Ross added a noticeable amount of muscle to his upper body this offseason, Katherine Terrell of ESPN.com reports. Ross was a full participant in 11-on-11 drills at the first round of OTAs, Jim Owczarski of The Cincinnati Enquirer reports. Analysis: Bengals coach Marvin Lewis deemed Ross healthy in March, clearing the second-year wideout for all activities during the offseason program. While his medical record now includes torn labrums in both shoulders, an ACL tear, two meniscus tears and microfracture surgery, Ross is at least healthy for the time being. He'll have every opportunity to supplant Brandon LaFell as the No. 2 receiver after the 31-year-old managed just 6.2 yards per target with three touchdowns on 52 catches last season. Bengals head coach Marvin Lewis said Ross (shoulder) is "all fixed now", Geoff Hobson of the team's official website reports. "[Ross] wasn't in my doghouse. I don't have a doghouse," Lewis said. "I think he's all the ability we wanted. That's why we drafted him. He had to get fixed. We knew he was injured going in and he got nicked up a couple of times in his lower legs and the other shoulder was bothering him. He's all fixed now." 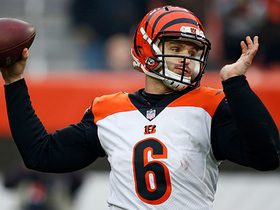 The Bengals believe that Ross (shoulder) will be cleared to resume running routes during the team's offseason program, Geoff Hobson of the Bengals' official site reports. Ross, who was placed on injured reserve Wednesday, is expected to require surgery to repair the labrum in his left shoulder, Geoff Hobson of Bengals.com reports. 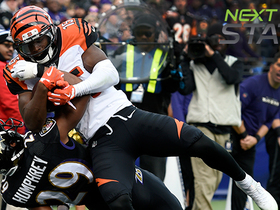 The Bengals placed Ross (shoulder) on injured reserve Wednesday. Ross (shoulder) didn't practice Wednesday. Ross (coach's decision) is inactive for Monday's game against the Steelers, Jay Morrison of the Dayton Daily News reports. 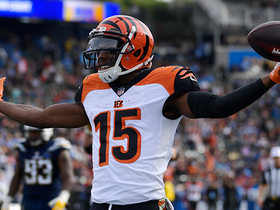 Analysis: Ross has regularly been a healthy scratch this season and that's unlikely to change unless the Bengals fall out of playoff contention or an injury strikes a receiver above him on the depth chart. Ross (coach's decision) is inactive Sunday against the Browns. Analysis: Ross has suited up only three times this year and has yet to record a catch on just two targets. The Bengals will instead operate with a passing game led by A.J. Green and Brandon LaFell, with Tyler Boyd and Alex Erickson serving as complementary options. Ross doesn't have much fantasy value in redraft leagues at this point, and Jim Owczarski of The Cincinnati Enquirer even goes as far as suggesting he won't be used until the Bengals are out of playoff contention. Ross (coach's decision) is inactive for Sunday's contest in Denver. 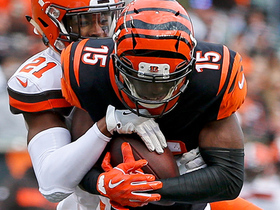 Analysis: Head coach Marvin Lewis critiqued Ross' effort level during the week, noting the rookie wide receiver pulled up on a route down the right sideline last Sunday against the Titans. Consequently, it's no surprise Ross is a healthy scratch, as he's firmly in Lewis' doghouse at the moment. Expect Josh Malone, Tyler Boyd and Alex Erickson to see any targets not directed at A.J. Green and Brandon LaFell. Bengals head coach Marvin Lewis said Wednesday that he was disappointed with Ross's effort during a third-down play in the second quarter of Sunday's loss to the Titans, Paul Dehner Jr. of The Cincinnati Enquirer reports. "John had a play last week we weren't very thrilled with," Lewis said, in reference to Ross slowing down on a route when he thought he wasn't being targeted by quarterback Andy Dalton on the play. "He let his teammates down." 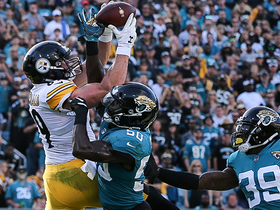 Analysis: After being inactive for the Week 9 loss to the Jaguars, Ross earned a spot on the game day roster against Tennessee, but logged only six snaps in the contest, with his lone target coming on the aforementioned play. Given Lewis' harsh words, it seems as if Ross could again be at risk of landing on the inactive list ahead of the Week 11 matchup with the Broncos, with a healthy Tyler Boyd the most likely candidate to take the rookie's spot if that's the case. Ross is active for Sunday's game against the Titans, Jay Morrison of the Dayton Daily News reports. Ross (coach's decision) is inactive for Sunday's game against the Jaguars, Paul Dehner Jr. of The Cincinnati Enquirer reports.